Do real Donald Trump fans wear tie-dye? Eagles fans have been a happy bunch lately. A commanding 3-0 start and an impressive team culture forming around head coach Doug Pederson have created an unusual climate in Philadelphia. If only to reign in all the unbridled optimism, someone really had to do something about this. 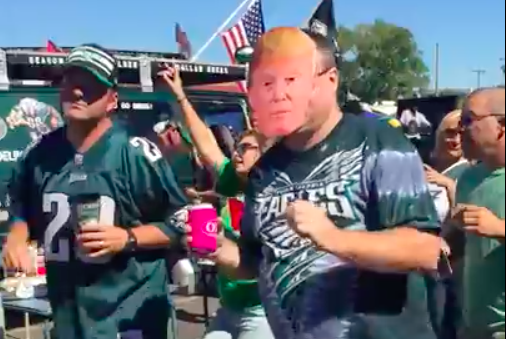 We give thanks to Deadspin for this wonderful video, which depicts a dancing Eagles fan in a Donald Trump mask getting hit in Trump's face with a doughy Amoroso roll. Only a few things warrant wasting a perfectly good hoagie roll in this manner. One is ducklings, another is lake fishing at summer day camps and the last one is a guy in a Trump mask. If this is any indication of what to expect on Halloween this year, people might want to rethink their plans to be Donald Trump. As the debates finally pit the candidates against one another on a national stage, we're entering the fanatical throes of the election cycle, the point of no return for our dumbfound pleasantries. One of these candidates, Hillary Clinton or Trump, will be directing and speaking for your United States for at least the next four years. The only constant, it seems, is Eagles fans throwing stuff at stuff.